Munich (München) is a major economic hub in Bavaria in the south of Germany and lies 660km south-east from Amsterdam. Non-stop flights between Amsterdam Schiphol airport (AMS) and Munich Frans Jozef Strauss airport (MUC) are operated by KLM and Lufthansa. The scheduled flight time is 90 minutes. Lufthansa (Star Alliance) flies up to 7x daily using a variety of aircraft – Canadair Regional Jet 900, Embraer 195, Airbus A319 and Fokker 100. Some flights are operated by subsidiaries and partners including Lufthansa Cityline, Air Dolomiti and Helvetic Airways. Return fares start at about €110 excluding checked luggage but you should book well ahead. Munich airport is one of Lufthansa’s principal hubs. Dutch airline KLM (Skyteam) flies the route up to 6x daily using Boeing 737s and the occasional Embraer 190 (KLM Cityhopper branded). Prices also start at around €110 return not including checked luggage. Lufthansa low-cost subsidiary Eurowings flies daily between Amsterdam and Munich using an Airbus A319 aircraft. Basic fares start from about €80 return, excluding luggage. Transavia flies 6x weekly on the Amsterdam-Munich route using Boeing 737s with prices broadly similar to Eurowings. Germany and the Netherlands are both members of the Schengen Zone so it is (normally) not necessary to go through passport control when travelling between Amsterdam and Munich. The Amsterdam to Munich trip can be easily done by rail during the day using German ICE services. One change is required in Germany and the journey time is around 8 hours. For example, travel on the 0802 ICE from Amsterdam which arrives in Mannheim Hbf at 1223. Then take another ICE departing Mannheim at 1230 and this train arrives at Munich Hbf at 1541. For Munich to Amsterdam, an ICE train departs Munich Hbf at 0945 arriving in Frankfurt Hbf at 1304 – where you then take the 1329 ICE to Amsterdam which arrives at 1728. By booking well in advance you can find one-way fares of €39.90 (2nd class) and €69.90 (1st class). First class passengers can use lounges at Amsterdam and Munich stations. Note, the CityNightLine night train service between Amsterdam and Munich has not been running since 2017. There is an OBB Nightjet (Austrian Railways) service running nightly from Düsseldorf to Munich. 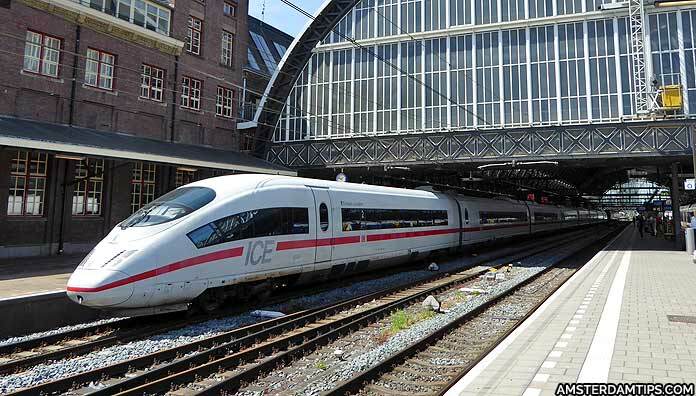 Travel between Amsterdam and Düsseldorf can be done easily by International ICE train. 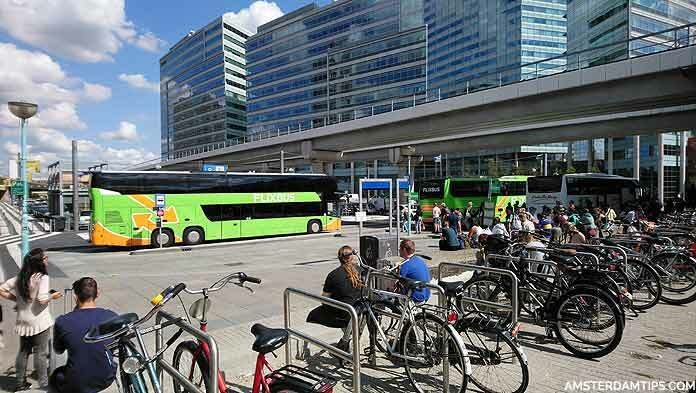 German coach company Flixbus runs up to 3x daily (overnight) direct services to Munich with a journey time of 12-15 hours. There are other services which require a change in Germany. Singles start from €36. Eurolines runs indirect (via Paris) overnight coach services from its Amsterdam Duivendrecht terminal to Munich Zentral Omnibus. The journey can take 17 to 21 hours. One-way fares start from around €45.